To prepare horses and riders for eventing competition through responsible, conscientious management; producing healthy, well trained horses managed by people who are accountable, knowledgeable, well organized and who will enjoy the sport and the horses throughout their lives. The horses come first as they will continue to teach us how to better conduct our lives with lessons on communication, attention to detail and responsibility to the greater community. 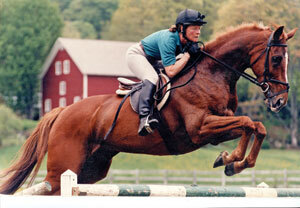 Janine has been in the saddle since she was 7 years old, and involved in eventing for thirty years. She has successfully competed through the Intermediate and one star levels. She currently trains and coaches through Preliminary. She has been designing x-country and stadium courses for 18 years and is a USEF “r” licensed Eventing course designer. She has designed courses at GMHA, Hitching Post Farm, and other events in New England and Canada. She has used her eye and expertise to complete courses at Jersey Fresh (NJ), Fair Hill International (MD), Plantation Field (PA), Over the Walls (MA), and Sporting Days (SC) events.